Caramelised onion is a wonder food. The humble onion, when cooked slow and long to release its natural sugars transforms into a sticky, sweet and savoury taste sensation that adds incredible flavour and richness to a simple host of foods – steak, roast beef sandwiches, root vegetables and more. In this recipe I celebrate caramelised onion as the star ingredient, rather than the bit on the side. 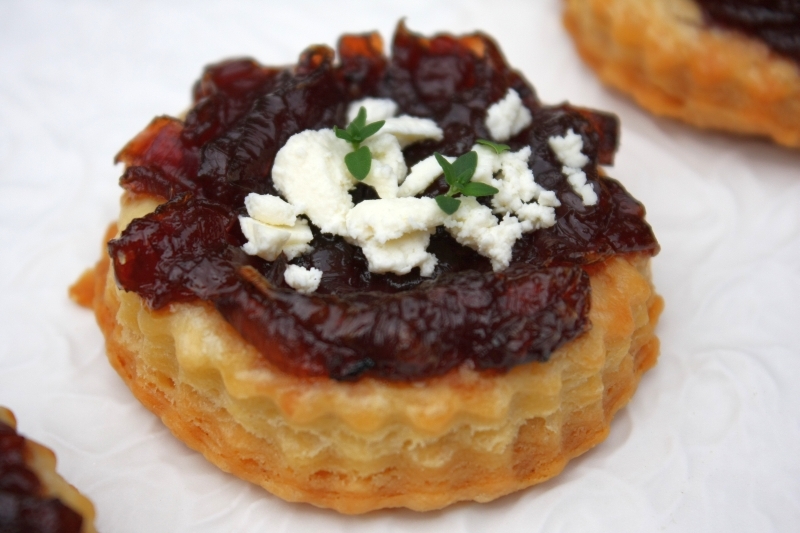 These little tarts, topped with caramelised onion and some crumbled feta, are perfect for late afternoon drinks, a party, or even for lunch if you make them a little bigger and serve with a salad. I can’t take credit for the pastry recipe, although I wish I could. it comes from Maggie Beer’s book Maggie’s Table, and it is absolutely the easiest and most impressive pastry I have ever made. You can buy this book online, although it was published quite a while ago. I have a copy of the original hardback edition and I love it. I include the recipe here because you simply must try it, even if you have never made pastry, or hate making pastry, or feel like a failure every time you make pastry. This is your carpe diem pastry moment. Put the onions, thyme, olive oil and water into a large saucepan over a low heat and cook, covered, for 1 hour. Stir once or twice during this time. After then the onions should be soft and just starting to brown. Add the brown sugar and balsamic vinegar and season well with the salt and pepper and continue to cook for another 30 minutes until the onions are dark, caramelised and richly sticky. It will keep for about a week, in an airtight container in the fridge. Heat oven to 180 C. To make the pastry, dice the butter, then pulse with the flour in a food processor until the mixture resembles fine breadcrumbs. Add the sour cream and continue to pulse until the dough starts to incorporate into a ball. Wrap the dough in plastic film and refrigerate for about 20 minutes. Roll the chilled pastry out until 3 mm thick. 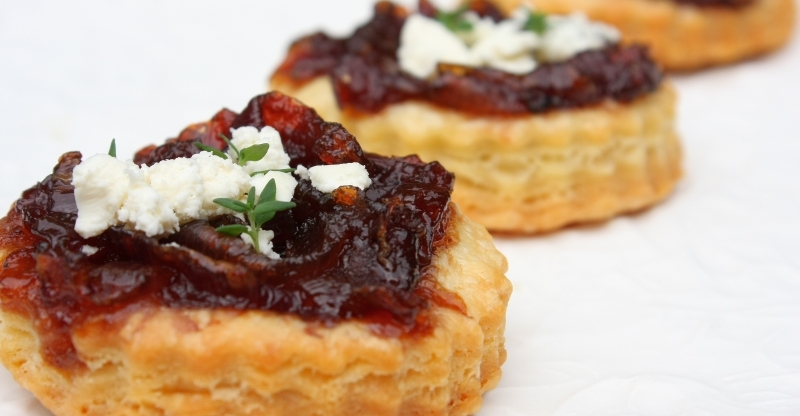 Cut into rounds using a fluted scone cutter. I used one that was 7 1/2 cm in diameter, but you could make smaller or larger ones to suit your taste. This amount of pastry will make about 24 rounds that size. Place the pastry on a tray and cook in the oven for about 15 minutes, or until the pastry is nearly done. It will puff up in a miraculous way. Quickly take out of the oven and top with generous spoonfuls of the caramelised onion then put back in the oven for another 5 minutes. 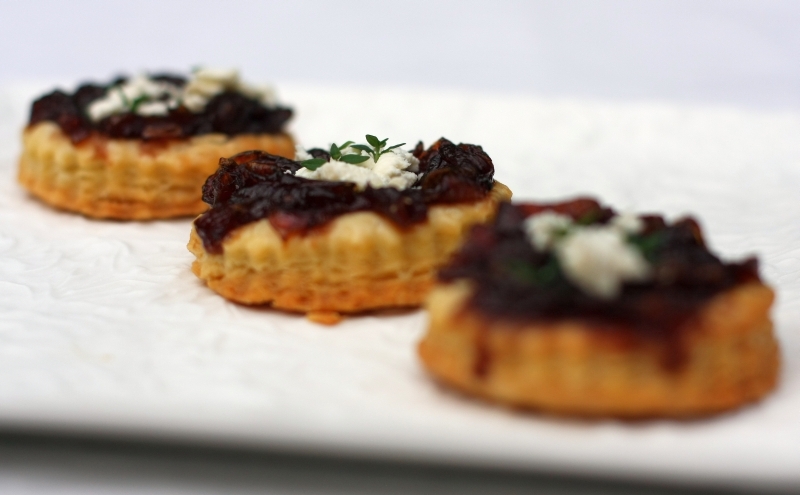 Serve hot or warm, topped with a little feta and a sprinkling of fresh herbs – thyme or chives. Definitely on this weekend’s to-make list!! I agree with you about Maggie B’s sour cream pastry, THE best and most versatile pastry recipe ever!